Tata Hitachi participated in the in the 6th edition of the India Golf Expo on April 20th and 21st at DLF Club Gurgaon. Organized by the Indian Golf Industry Association the Expo featured a knowledge symposium, an exhibition of golf’s leading brands, a turf grass seminar, a coaching summit, a giant pro shop with exclusive deals, golf simulators, putting & chipping competitions, networking lunches & dinners & award ceremonies. 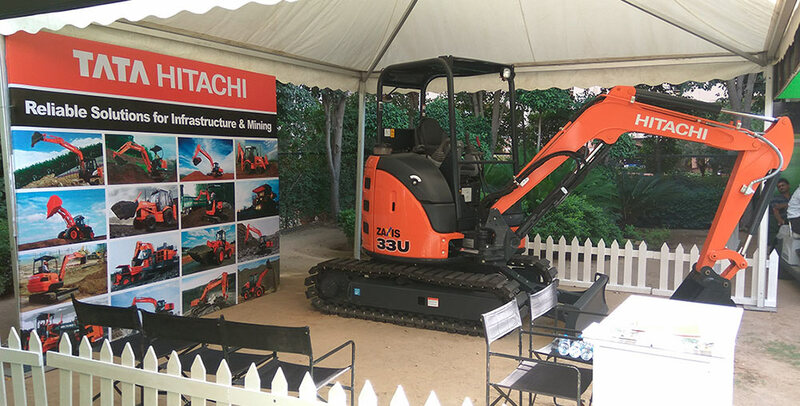 On display, from Tata Hitachi was the Compact & Power packed ZAXIS 33U Mini Excavator. This machine was fitted with rubber pads on the track chain to make it suitable for Golf turf application. The ZAXIS 33U with its versatile application possibilities generated a lot of curiosity among the visitors.